Harborfront competition for the HS4 site with real estate developer, urbanism, design, business district & development, tech communities and industries, and coworking spaces with related services. Oct-Nov 2018. 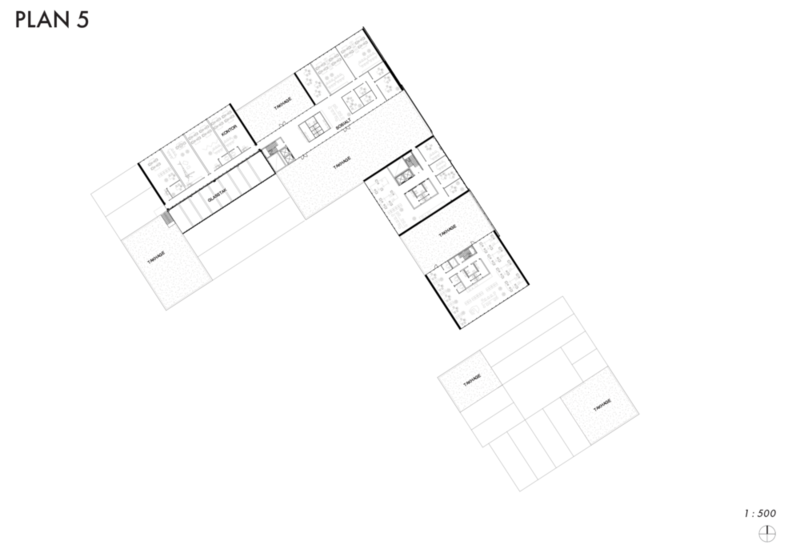 This entry was awarded a 2nd place for the proposal of a knowledge district in Horten. HS4 is a small piece of property in the context that has been pointed out as a prospect for creating attractivity. The project received high remarks by the jury as undeniably the most contemporary proposal for the site, its analytical thoroughness, modern approach to architectural design, most convincing conceptual proposal, clearest use of programmatic functions, and treatment of identity. Most notably, was how Knoppskyter challenged the popular belief and changed the jurors perception of blindly developing housing projects on the harborfront as first development stage. Regardless of the competition,it was recommended that the project be realised on an alternative site. The jurors report can be read here. Horten Industripark with NSW, SLA & TIN. Illustrations: Forbes Massie. ISSUU Link. NB! Norwegian only, sorry amigos! Horten is well represented by different types of collocations, either it be trade, arts and cultural services, offshore industry, and knowledge-intensive education and industry. Yet, none of these actually overlap as a holistic entity, neither are they within the city centre perimeter. 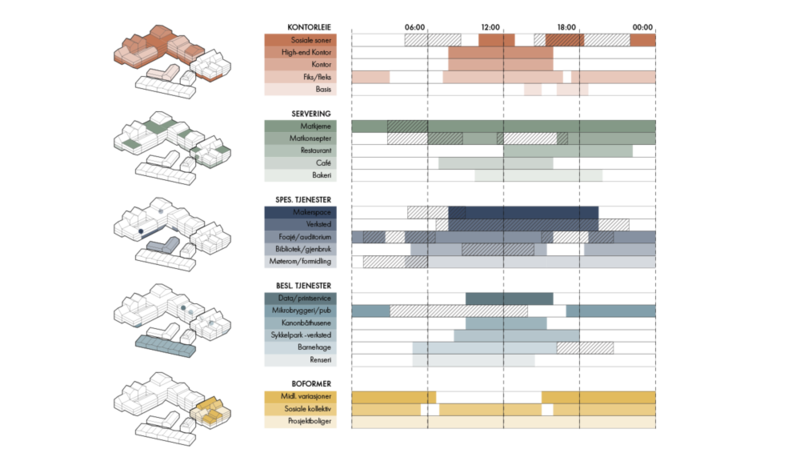 In Gehl also pointed out in his report, that the industry and part of identity intrinsic to Horten, such as nano- and microelectronics, was completely absent from the city centre. The proposal is a knowledge districts aimed at merging student life, entrepreneurs and established companies through related social, everyday and specialised and operational services for knowledge-intensive companies. The vision does not only deal with a direct collocation of both knowledge- and creative production for the HS4 site, but that the sum of knowledge workers also brings with them a social and urban potential nuancing the urbanity in Horten. Absence of knowledge (nano, micro, electronics) in the city centre. Even though this is the case, the municipality points that it is crucial for the city to attract knowledge-intensive companies and increase Hortens attractivity in general. Note, the accumulation of knowledge workers within a certain place brings with it a social dimension that will be beneficial for the city and its attractivity. Horten’s vague identity and reputation. The reports describe it as geographical places and historical buildings. 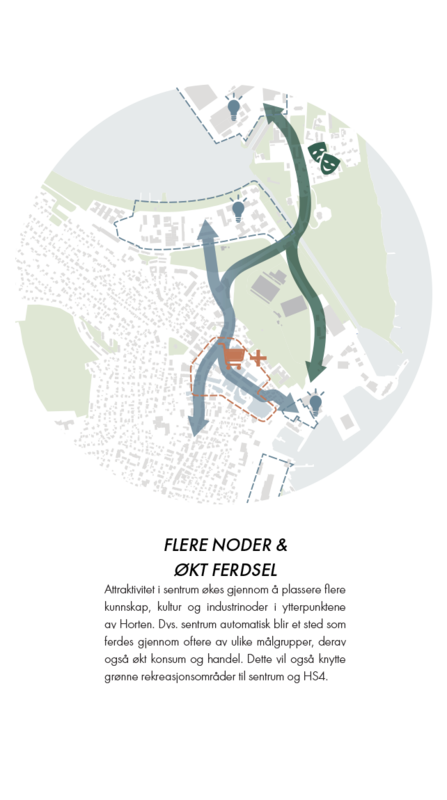 This proposal believes it is possible the deal with the full depth of identity, namely the immaterial human capital of the city in the urban interventions that this task demands. Contradictory reports on shopping, trade and commerce. Compiling the different reports, it also becomes apparent that they contradict each other. While one renowned researcher say that an expansion of the shopping outside the central square can upset the livelyhood of existing stores, whereas another report points out that a smaller shopping facilities on the harborfront will not make a difference to the central square. The only thing safe to say concerning this issue, is that of an alternative to shopping will more likely help increase consumerism, rather than increase with the volume of shops and stores on the harborfront. Fragile housing prospects. There resides unsubstantiated sense of optimism on the housing development front, with possibilities of 2500 more units in the outer and inner harborfronts of Horten. Earlier analysis show on the other hand, fragile conditions on all if the prospects if the current and future development should be dispersed. An attractor seems like a better route to secure the future success of the housing projects in the surrounding sites of HS4. Read more in the booklet (page 13-15). HS4 early development date and site limitations allows it to secure interests for neighbouring prospects. As it is a mere fraction of the entire harbor, HS4 cannot take in all the possiblities and challenges of Horten. Yet, one crucial approach towards collocation of niche communities within knowledge-based industries, and how the study of social and professional structures and help substantiate all 4 topics in consecutively. What constitutes a functional social and professional community? Both theory and practice show that one has to ynderstand prestigious socities as both highly professional, yet also casual, a blend of polarizing topics as it demands both low-key meeting places, actions in the pre-production, production and post-production phases, and a sharp eye on ongoing organic networks and opportunities that might emerge along the way. To plan such a community requires also a curation of its members and speculation into which sum of specific individuals that contributes the most socially, professionally and/or intellectually. There is also an excersise of identifying the dominant working cultures as to know which ones one has to address within a given city. The hypothesis is that 10 employees within the same company have a bigger presence and more established working culture, than 10 separate freelancers doing their own thing. A study of employment rates, distribution within sectors and company sizes gives an indicator of dominant working cultures in Horten. The design is based on ecclectic choices of what the team read as inherent and beneficial qualities for Horten. The design language is to unite new design practices with old traditions in Horten, introducing modernity through familiarity. 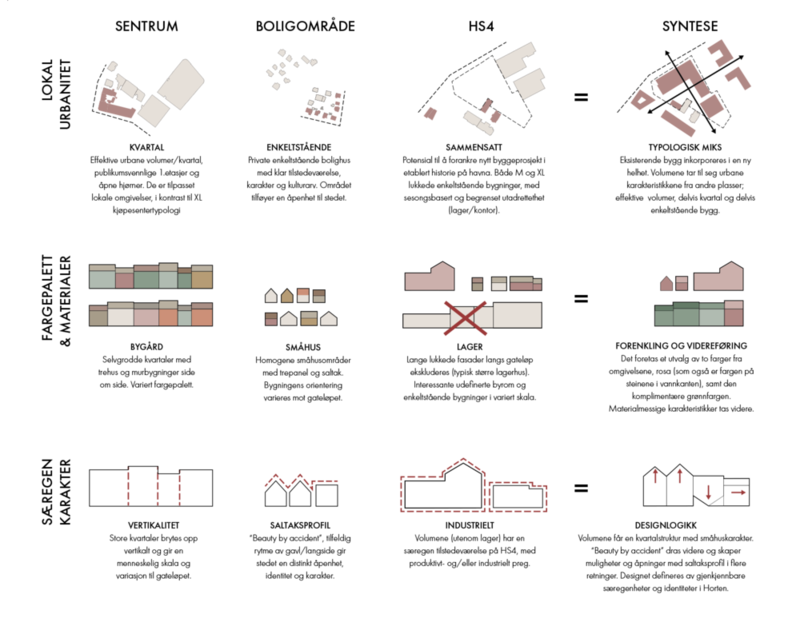 Some of the qualities kept were local color schemes, typologies, rowhouse aestethics, tree architecture, single-houses vs. bigger quarterstructures etc. The design has also a built-in flexibility in the floorplans and can be quickly adjusted to the demands and changes in the market. The programming is also a sum of ecclectic choices but with a different purpose - to foster and cultivate specific working cultures and increase dialogue between professionals that usually do not meet in the city. Since the aspect of everyday life is equally important, both the inhabitants and the visitors has been factored as an integral part of the idea of the community and stories that can unfold. The traditional office hours constitute only 22% of the use of any commercial real estate. This project aims to increase or double the use of the complexes for both sustainable, social and practicle purposes. The proposal consists of different rental models for office spaces and related social and professional services. The programs are among others: coworking spaces S/M/L, high-end office spaces, multi-workshop, library, reuse center, related and specialised services (dry cleaning, pc repair, café etc. ), food innovation, commercial boathouses, kindergarten, project-based apartments (short/long term). 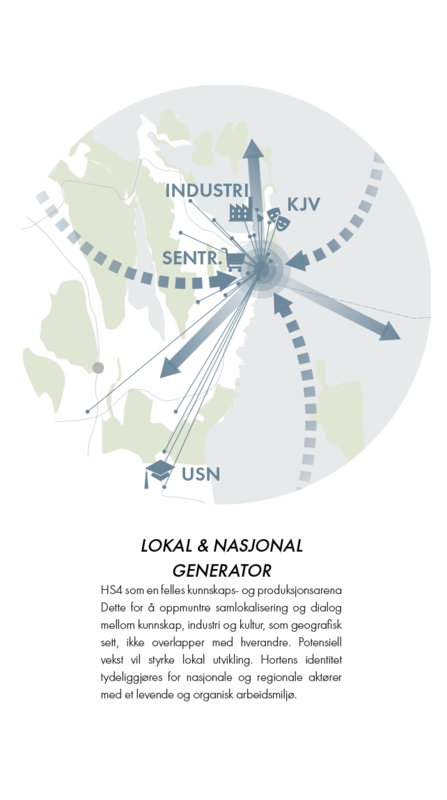 The business district in HS4 is to create the overlaps that is not happening locally and encourage regional and national interest and dialogue in Horten between industry, culture and education. 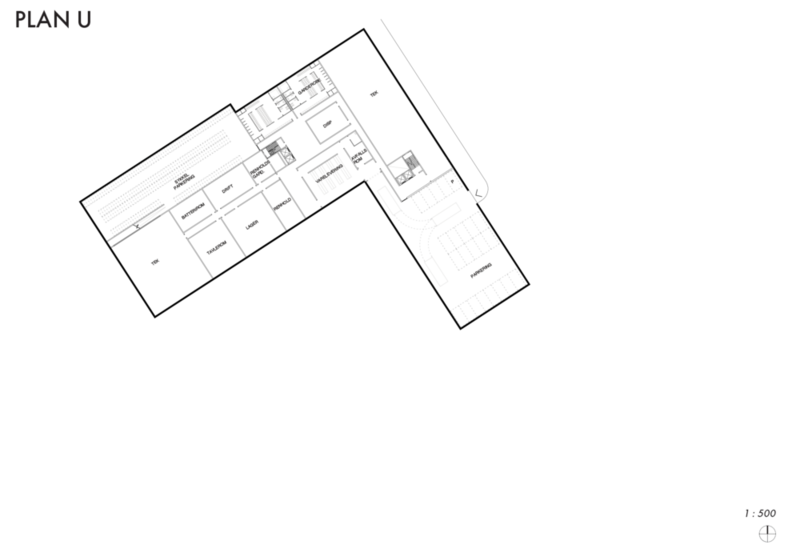 By creating nodes of different characteron each side of the city centre, one is also increasing the frequency of consumers within the city without competing with it. HS4 will also liberate central sites for more suitable purposes. A strategy will also be established for companies within HS4 to continue and grow and stay within the city centre. Why does this project propose old-fashioned and smaller partitions of office spaces? Does it not work against the idea of a collaborative community? The answer lies in understanding both organisational structures and corporate cultures inherent in any company. Current data show that 70% of all companies registered in Horten (coincidently also the average for Norway) have only between 1-9 employees, realistically making up for 19% of Horten’s entire workforce. This means an increase in smaller units, which also means that there is an increase in multiple and separate corporate cultures at once. This has been pointed as a major challenge in many open workspace with many unrelated/related freelancers and small companies. To lessen the convenience of staying apart, most of the partitions are designed as incomplete, forcing the workers to use the common kitchen, social area, and toilets and interact and meet each other. The big difference here (as opposed to designing activity-based floorplans or open office spaces), is that the unrelated companies has the choice between working privately or collectively. In this context, the old-fashioned partitions of office spaces has proven crucial in solving the social challenges of housing and concentrating multiple working and corporate structures into a holistic community.